First thought just rampant speculation and silly rumor, it is apparently now all but officially confirmed that a gold (but not a tacky gold, mind you, "more of a champagne color") phone will be the new edition to the iPhone line when Apple makes its announcement next month. And I could truly care less. 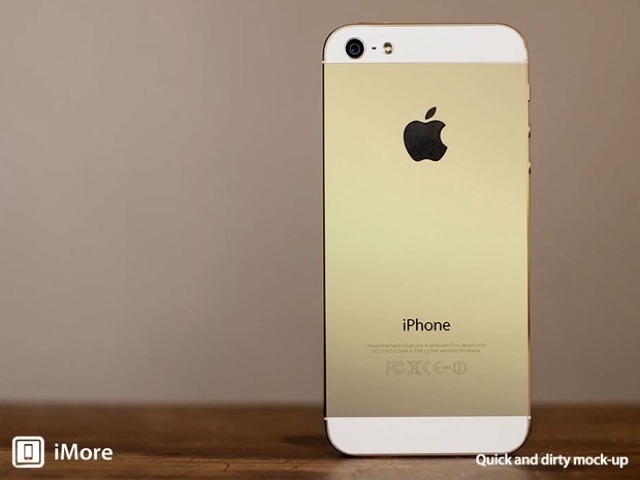 Okay, I get that the gold color is more for the Chinese market than the American, so "gold iPhone" isn't really for us. And I get that every other year, Apple doesn't make any major improvements to its phone line, it simply adds an "S" to the model number [for "Seriously no different"? ], changes a couple of things around, and expects (justifiably, it seems) for millions of iPhone owners to ditch their phones and camp out overnight waiting to be the first to get the new ones. I will not be one of those people. I love my iOS devices. I carry both my iPhone and iPad everywhere. I now even take all of my meeting notes on my iPad. But I've never bought into the fangirl-like crazy that surrounds the iDevices. I used to be a technogeek who wanted everything first. Then I grew up. Now it's about utility and common sense. I skipped the iPhone 5. Other than a better camera, there wasn't much available on that version that I didn't get on my iPhone 4 with a simple iOS upgrade. Yes, there is the new port, but that was more of a con than a pro. Had Apple changed to a universal plug like every freaking other phone maker on the planet, that would have been a draw. But noooooo, always one to be different, Apple simply changed to its own tiny, non-interchangeable port, which would make every plug, dock, stand, and radio I own obsolete. No thank you. So now there's a new phone. And you can get it in gold. Whoopdefreakingdo. There's a possibility that the 5s may have fingerprint technology to keep your files safe. Unlike the gold, this feature is purely conjecture based on Apple's purchase of the security firm AuthenTec back in 2012. One confirmed feature is that the new phone will be equipped with iOS 7; but, like every iOS release since the beginning of iPhone time, the operating system will also be available on every earlier model (with some feature limitations on the older models). So... Basically... Gold. That's what you're getting with the latest iPhone that's different from its last incarnation. You wanna impress me, Apple? Add a USB port, allow Flash websites to play, let me customize fonts in e-mail, make Siri more useful, or stop deleting my contacts randomly. Of course, I'll have to wait until the official September 10 announcement to completely pass judgment; but since CNet and other tech bloggers have rarely steered me wrong before, I'm not generally expecting much different.